What Can TCM Treat? Womens Health: Menses — Amy Chitwood Burslem, LAc. 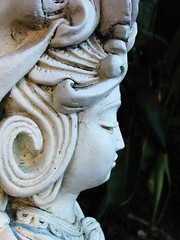 Kuan Yin Photo by: colorcritical This is a subject that many women don't like to discuss, or if they do, it's often in a negative manner for a lot of valid reasons. The menstrual cycle is different for every female, and TCM treatment with acupuncture, moxibustion, and especially herbal formulas is a great way to relieve some of the symptoms women may experience with their cycles. TCM can help with irregular cycles, heavy bleeding, and many other symptoms.TCM herbal therapies are excellent for alleviating PMS symptoms, such as mood swings, uterine cramping, and breast tenderness. In TCM theory, Liver Qi stagnation is the reason for these symptoms, and a modification of the formula Xiao Yao Wan (Free and Easy Wanderer) can help relieve these symptoms. (Click here for a great summary of the formula by ITM's (Institute of Traditional Medicine) Subhuti Dharmananda). Ba Zhen Wan (Women's Precious Pills) is another formula that is often given to women after they finish the cycle. It is meant to nourish and rebuild the blood that was lost during menses. Keep in mind that herbal formulas are often meant to be taken before the symptoms even start- they aren't like Advil where you take them after you feel the pain. Ask your practitioner about taking TCM formulas for PMS before you try them. The herbs, in conjunction with acupuncture (usually points located on the limbs and head will be used, and sometimes on the lower abdomen) are a great way to keep the symptoms away. Women often feel more sensitive when nearing or at the beginning of the cycle, so the needles, while they shouldn't hurt, may feel stronger than usual. There are a lot of amazing practitioners who specialize in women's health, so check out acufinder.com to find a practitioner near you.